Lackluster travels in the nation’s lower quarter. In his best moments, Heldrich (Arts and Sciences/Univ. of Washington, Tacoma) serves up affecting essays about little-visited places out on the prairie and desert where he communes with the spirit of Willa Cather, ponders the meaning of rodeos and gun shows, and drinks a lot of beer. He blends nicely observed vignettes (a cracker-barrel philosopher too drunk to pronounce “epistemology,” the precise makeup of the garbage below a Kansas overpass) with pleasing allusions (his book may contain the only application of a John Ashbery poem to a dusty New Mexico back road), and he gets in some affectionate fun-poking at cultural commonplaces Out West: cowboy boots, cheap motels, college football. 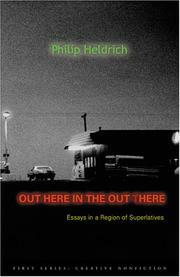 Yet Out Here suffers from a certain heavy-handedness: Heldrich is too fond of insisting that, unlike him, the rest of America is blind to the virtues of the outback (“They seem to have an implicit fear of the land, an anxiety of separation, of being too far from the mall”), and he’s too quickly given to cloying exaltations (“Whenever I bite into a tortilla, I can’t help but think I’m connecting with the age of the great Maya and Aztec cultures before the continuing Conquest”). Heldrich also seems unaware that the wandering-the-byways-to-deliver-social-criticism (and, yes, exaltations) trope has been done before, and much better, by the likes of Ian Frazier, Edward Abbey, and William Least Heat-Moon. (His idea that the Okies went to California to be fashionable suggests that he should brush up on John Steinbeck’s work, too.) When he turns to the inevitable, things get even worse; an essay on Las Vegas, always an easy target, is a below-average evocation of a place that has earned a whole library of bad writing, and a piece on Disneyland, an easier target still, is staggeringly trite. A mixed bag, then: some good moments, but mostly unsatisfying.